Passing another vehicle is a normal part of driving, but it can be very dangerous. Before you start to pass, be sure that you have enough room to complete the maneuver. If you have to cut back into your lane too soon, then you run the risk of sideswiping the vehicle that you are attempting to pass. If you do not get back into the lane soon enough, you risk a head-on collision with another vehicle. So, when you are in the process of attempting to overtake and pass another vehicle on a two-lane road, then you should pass only to the left of the vehicle. Under certain circumstances, passing on the left [ORS 811. 410], or passing on the right [ORS 811.415], is unsafe and illegal. In this section, we shall discuss the details of each of these maneuvers. Under other circumstances, a slower driver must yield to an overtaking vehicle [ORS 811.425]. Also, passing in a no-passing zone is prohibited—except when turning into or from an intersection, alley, a private road, or driveway. This same rule applies when an obstruction requires driving to the left of the center of the roadway, as long as it is not done so in such a way that it would create an immediate hazard [ORS 811.420]. All of these circumstances—and the statutes which govern these situations—will be covered in this section. 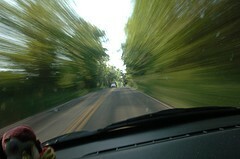 Know the speed and acceleration ability of your vehicle. Also, you should be able to estimate the speed of the vehicle you are passing and of any on-coming traffic. As a general rule, if you can recognize any movement of an oncoming vehicle, it is too close for you to risk a pass. So, when in doubt it is better to stay in your lane. Watch ahead for intersections—and do not pass while in an intersection. Stay well back of the vehicle you want to pass, especially large vehicles such as trucks and trailers, to give yourself a good view of the road ahead. Signal and check your rear-view and side-view mirrors before you change lanes. Also, check your blind spot. Move to the left only whens it is safe to do so. Complete your pass as soon as possible. When you can see the entire vehicle you passed in your rear-view mirror, signal and return to your lane. Do not exceed the posted speed limit when passing another vehicle. It is against the law to exceed the posted speed limits. Do not flash your bright lights to signal that you want to pass. It is illegal to flash your bright lights when following a vehicle closer than 350-feet. (a) The driver that is overtaking another vehicle—that is proceeding in the same direction—fails to pass to the left of the other vehicle at a safe distance. Also, the driver should not again drive to the right side of the roadway until he-she is safely clear of the overtaken vehicle. (b) Except when overtaking and passing on the right is permitted under ORS 811.415, the driver of an overtaken vehicle shall give the right of way in favor of the overtaking vehicle—and shall not increase the speed of the overtaken vehicle until completely passed by the overtaking vehicle. (c) A driver shall not drive to the left center of the roadway in overtaking and passing another vehicle when it is proceeding in the same direction unless the left side is clearly visible and is free of oncoming traffic. This is necessary so that there is a sufficient distance ahead to permit the overtaking and passing to be completed without interfering with the operation of a vehicle which is approaching from the opposite direction—or a vehicle overtaken. (d) An overtaking vehicle must return to an authorized lane of traffic as soon as practicable. (a) Drives a vehicle to overtake and pass on the right side of another vehicle at any time not permitted by this section. (b) Drives a vehicle to overtake and pass on the right side of another vehicle at any time by driving off the paved portion of the highway. (c) The roadway ahead of the overtaking vehicle is unobstructed for a sufficient distance to permit passage by the overtaking vehicle to be made safely. The driver you are passing is making or has signaled for a left turn. There must be sufficient space to the right for you to pass without leaving the paved portion of the roadway—and the roadway in front of the vehicle is clear. You are traveling on a roadway with two or more lanes traveling in the same and the vehicle you are passing is in the left lane. You may pass using the right lane. You may not pass on the right if any part of your vehicle will be off the paved part of the highway or move into a bike lane. Therefore, use extra care when you pass on the right. Other drivers do not expect to be passed on the right. You are in an area that is marked for no passing by a solid yellow line in your lane. A “Do Not Pass” sign may also be posted. Your view of oncoming traffic may be blocked because you are on a hill or a curve. You are approaching an intersection, railroad crossing, or other area where your view of oncoming traffic is limited. You are at or in an intersection. You are at or on a railroad crossing. The vehicle ahead of you is at a crosswalk to permit a pedestrian to cross. You may cross the center line in a no-passing zone only if the right side of the road is blocked—or if you are turning left into or from an intersection, alley, private road, or driveway. In the processing passed, there are a great many chances for a collision. The driver may cut in too sharply, you may choose to change lanes, or the driver may be forced back into your lane if the distance of oncoming traffic was misjudged. What can you do? You can help the other driver pass you safely by checking oncoming traffic and adjusting your speed to let the driver move back to into the right lane as soon as possible. So, when another driver starts to pass, stay to the right and do not speed up until the other driver has passed. DO NOT use your hands or lights to signal other drivers when to pass. The law prohibits flashing any of your lights at drivers to let them know when to pass.